red Gallery, 157 St Georges Road Fitzroy North is open Thursday to Sunday. 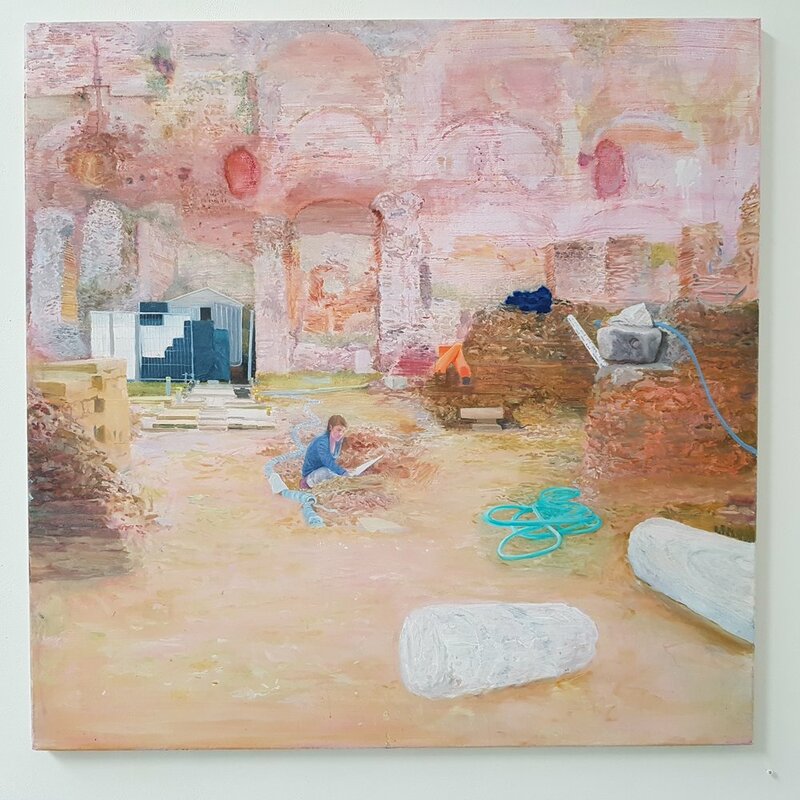 “Archaeology of practice 2” presents some works that have taken shape slowly. Besides two paintings referencing archaeological images, the works include a monoprint on unstretched canvas which started its life as marks of objects placed on a drop-sheet, a paper-maché object remade from paper related to my art studies, a painting in pinkysil silicone, paintings partly made from paint tubes and dried paint, a small wall shrine of painted mylar (Space blanket), an installation reminiscent of fragmented ancient wall tiles, and a walk-in fabric room whose walls are embedded with paint from the making of previous paintings and paint experiments. There’s also a table of small experimental objects and fragments which I make and keep as a vital part of my art practice. . I light-heartedly liken this sort of making to archaeology, in that I have collected objects, fragments and traces of artefacts from my past practice, considering their materials, colours and forms, reinterpreting, reassembling or connecting their parts to make new visual meanings, and displaying the new objects in a gallery. 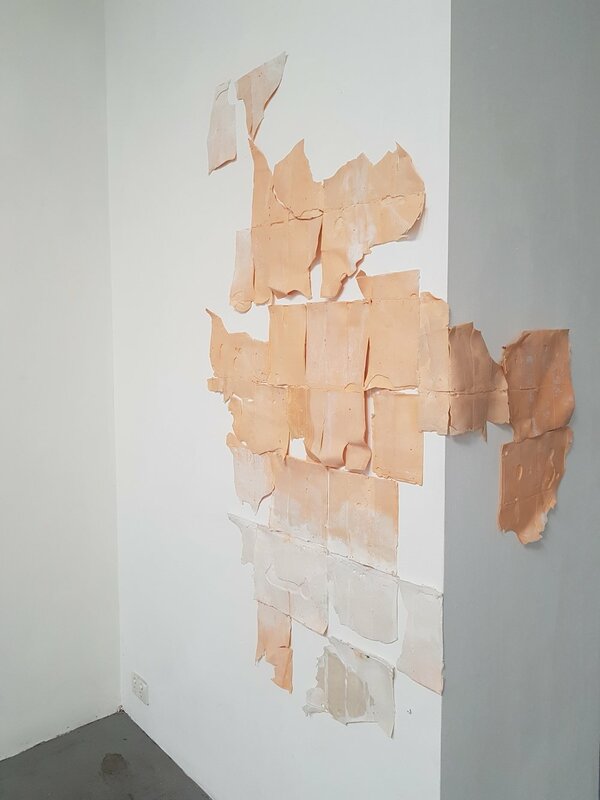 This body of work was also influenced by my fascination with the fragmentary and the ruin, the material properties and forms of paint, plaster, paper,silicone, the works of Piranesi, and my travels in Italy where the forms and materials of past are revealed, clearly embedded amongst the contemporary built fabric. Archaeology now has mass appeal, with television shows capturing the excitement of finding fragmentary evidence of cultural activity from the past, and reconstructing meanings from the found objects. I hope visitors might enjoy imaginatively reconstructing something about my practice, from this exhibition. Several works in a group exhibition running from July 5 to July 22. My works in the exhibition, are all made using paper in various forms. They range from collaged linocuts on board, through paint on paper, to painted papermaché objects hand made from paper items used in my art practice. Prices are as shown below. Art mag topography, 2017. Paper maché made from art magazines, PVA glue, muslin. Dimensions including muslin 90cm h x 45cm w x 2.5cm deep. Price $390. Detail of Art mag topography, 2017. Dune Terrain version 3, 2018. Collaged reduction linocuts and oil paint on archival paper mounted on board. 53cm x 53 cm x 2 cm. Art mag object pink/porphyry reversible 2018 Paper maché made from art magazines, PVA glue, acrylic paint, plaster of paris, plastic mesh, epoxy resin, superglue, epoxy glue Double sided, on base. Could also be hung on a wall. Irregular, approx. 33cm H x 24 cm W x 4 cm deep, without base. February 11 to March 11, 2018. The Langford120 summer exhibition of over 50 artists, curated by Irene Barberis. My work is "Lava at the urban edge", 2017, acrylic and oil on canvas, 93cm H x 93cm W . It was inspired by the volcanic flows around ancient Pompeii and Catania, and by the material qualities of paint. To Sunday 19 November 2017 A group exhibition of entries to the Print Award competition. One work, entitled "Aquifer", 2017. 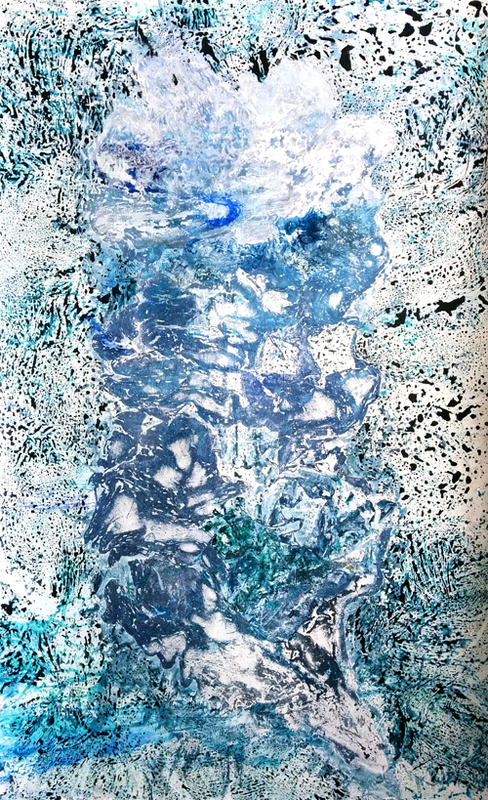 A unique monoprint, in acrylic paint on unstretched canvas, 145 cm H x 91 cm W.
"Aquifer", 2017. Unique monoprint, acrylic paint on unstretched canvas, 145 cm H x 91 cm W.
Aquifer", 2017. Unique monoprint, acrylic paint on unstretched canvas, 145 cm H x 91 cm W.
"Archaeology of practice" shows some works that have taken shape slowly over the last 6 years, sometimes changing radically from their original state. They include a large painting on unstretched canvas which started its life as marks on a dropsheet, a smaller painting that reimagines a landscape from an old map, a re-assembled linocut, papier-mache objects, and a cabinet of small experimental objects which I make as a vital part of my everyday studio practice. The making process has some parallels with archaeology, in that I considered objects, fragments and traces of artefacts I had accumulated in my past practice, considering their materials, colours and forms, and reinterpreting, reassembling or connecting reconnecting their parts to make new visual meanings. "Archaeology of practice: experimental objects 2010 - 2016". 42 objects, mixed media. Installation view, "RSVP, side 1", 2016. 26 cm H Paper-mache made from exhibition invitations, PVA, expoxy resin, acrylic paint. Installation view, "RSVP, side 2", 2016. 26 cm H Paper-mache made from exhibition invitations, PVA, expoxy resin, acrylic paint. "This turns into That: Abstract works” groups some of my abstract paintings, objects and an installation of fabric. Most of the works were generated in a process where the remnants or outcomes of making one work became the start of another. Gradually, with successive actions – brushstroking, deforming, pouring, flaking, transfer between surfaces, obscuring older layers – the marks, forms and colours accumulate, until a work looks lastingly interesting. 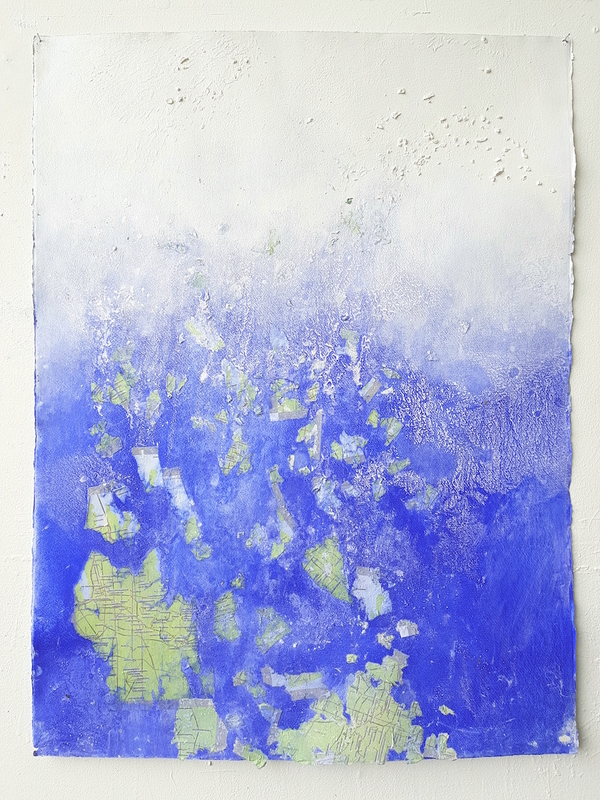 These works reflect my deep interest in materiality, and in developing innovative processes that cross boundaries – between painting, printmaking and object making. Even the installation "Viewfinder" (a playful fabric 'room' with holes framing views through it), was developed from research involving these sorts of paintings. 8. Viewfinder (2016). Polyester netting, nylon line, Dimensions variable. P.O.A.